The JP2 Foundation is hosting three concerts by the Papplewick School Choir. The school is a boys’ day and boarding prep school in Ascot, UK, opposite the famous racecourse. 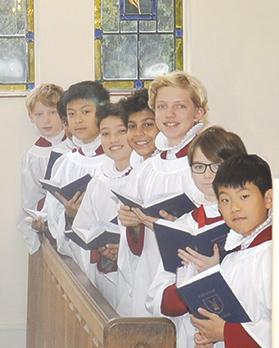 There are about 210 pupils and although a non-selective school, Papplewick has an impressive record for boys achieving scholarships to the major public schools such as Eton and Harrow. The school is proud to have been chosen as the Tatler ‘Prep School of the Year’ in 2019. Choir director Chris Goodwin, appointed organist at Papplewick eight years ago, was organ scholar at Pembroke College, Cambridge and subsequently studied organ under John Birch at the Royal College of Music. He has lived and worked in Ascot for some 30 years. He was organist and choirmaster at Ascot parish church and is much involved in local schools and musical theatre. He is now director of chapel music at Papplewick and also director of music at St Andrew’s parish church, Sonning-on-Thames. The choir’s first performance in Malta will be at St John of the Cross parish church, Ta’ Xbiex tomorrow, Saturday, at 7.15pm. This concert, in full collaboration with Ta’ Xbiex local council and the Discalced Carmelite Fairs, is part of the celebrations marking the 50th anniversary of the parish church. The second concert will take place at the Transfiguration parish church in Lija on Sunday at 6.30pm. The concert is in full collaboration with Lija local council and the parish church. The third concert will be held on Monday at 6.30pm at the Sanctuary of Our Lady of Pompeii in Marsaxlokk. Entrance to the concerts is free but a donation would be welcome.